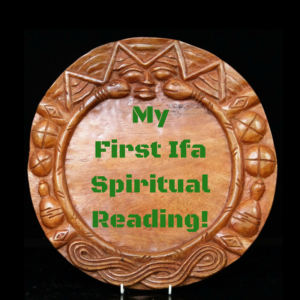 I was introduced to Ifa and Orisha traditions many years ago, but my introduction lasted a few years. I did other things spiritually before Orisha, Ifa, and Egun, but I’ll start with Ifa. A friend of mine kept asking me if I knew about Ifa. (I personally thought that she was crazy, and I never paid her any mind.) She and I were much into spirituality, divination, higher self, and she kept at it. Then one day, she asked and I finally cracked and asked what is this ‘Eefa’ (lol) yes I emphasized it eeeefffaaa. She told me that Ifa dealt with the Orishas, and (picture a blank face here), that was me. She then told me that I might have heard of it as Santeria. My ears now perked up. I was like ‘WHAT DID YOU SAY? DID YOU SAY SANTERIA? WHY DIDN’T YOU SAY THAT BEFORE?’. Now she had my undivided attention. She began to explain about Elegba, Oshun, (didn’t know the names), and then went to bembes, and readings. I was uber excited at this point and wanted more. I loved the exclusivity, mysteriousness, and just delicious cultural and spiritual goodness that Santeria gave off and I finally had an ‘in’ to someone who knew someone, and not a tarot reader in a botanica. She introduced me to a guy that had some title that I didn’t know how to pronounce ‘Babalawo’, I remember that I kept butchering his title, and I didn’t know what that meant. She gave me his number, and I was on my way. I took the many trains in NY to get to him in the Bronx, (4 trains each way!) and I remember waiting a bit before going into the building. I mean, I didn’t know what was going to happen to me. This could be a serial killer for all I knew and I had basically asked and was waiting to be killed! I trusted my friend, and went to the door. He opened the door and walked in. I immediately LOOVED the smell of the house. It smelled like brujeria lol (candles, incense and witchy stuff). He made me feel comfortable and I basically sat like a statue for a while unsure of what was going to happen to me. I did have my notebook, snacks, a skirt and a million questions! The reading began, and I remember that it took like an hour. I didn’t have a cell phone at that time, so I didn’t have any interruptions. I was there fully! These things intrigued me and I was on my way to find my destiny! Are you going to a reading soon? Going back in time in thinking of my spiritual journey, made me think of things that I wish that I would have known early, and things that I’ve learned along the way. Enter this checklist. 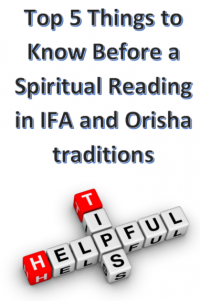 Here are the top 5 things that you need to know before receiving a spiritual reading with Ifa and Orisha traditions! Enjoy! 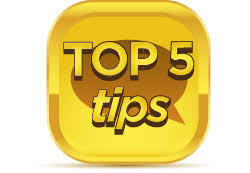 Click on this link to get your Top 5, or on the image below!